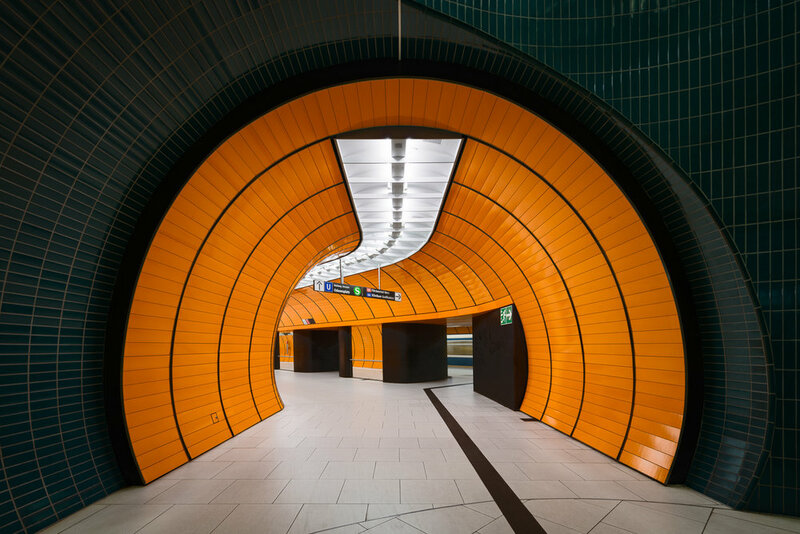 The tubular, bright orange passageways are a unique feature of the Marienplatz U-Bahn station. Hundreds of thousands of people pass through this station every day, completely enveloped in orange as they board their trains. Almost everyone, including me, uses the main entrance/exit escalators on the other end of the platform. One day, however, I decided to explore more of the station and discovered this less frequented entrance. It is tucked away in a corner and only accessed by a small elevator from the main square. I find the shapes, lines and curves to be fantastic here, as well as the slight bend in the passageway. Perhaps most importantly, there is a color other than orange! The dark green tiles provide great contrast, allowing the bright tunnel to draw your eyes right into it. It has become, by far, my favorite place to enter the orange. It has been several months since I posted an image from one of my favorite places to photograph…the Munich underground. This is Oberwiesenfeld Station on the U3 line. It is not one of the stations that is frequently photographed. Perhaps this is because the plain solid color on one side of the platform is, well, not very photogenic. From the center of the platform, the lines and patterns do not draw your attention. As a result, I scouted several different perspectives trying to find a better composition. The patterned black and white wall is, by far, the most interesting feature…so I concentrated on it. Once I found this dizzying angle, I knew I had the shot I wanted. I love including leading lines in images…and having lines from every surface pulling you toward the black tunnel at the far end was too much to resist. Can your eyes resist being pulled in to the void? When I am out wandering in a city, I often go inside buildings to scout for photo opportunities. Many times there is nothing I find interesting, but occasionally I am amazed at what is hidden from the outside. This was one of those lucky finds. This was taken in the Akademie der Wissenschaften in Berlin. Inside the main door, there was a reception area with a security guard and a small atrium just ahead. The security guard was on the phone, so I walked into the atrium to take a quick look. Honestly, there was not much look at, but I did happen to glance upward…and found this. I was not sure if photos were allowed inside. I have found that each place has its own policies and usually ask permission. So I figured I would ask this security guard…when he got of the phone…and I waited for about 5 minutes. He did not seem to be concerned that I was carrying a camera. Nor was he paying me much attention. Getting restless, I pondered whether to ask permission or just beg for forgiveness. I decided to go ahead an take the shot. I love using wide-angle lenses for architecture. However, as wide angle lenses can cause distortion, especially at the edges of an image, shooting very wide can result in challenges both in composition and in post processing. In most situations, photographers (including myself) want to eliminate any distortion in their image. However, I find there are times when this distortion can be used creatively and with interesting effects. This is Hasenbergl Station in Munich…flipped upside down. That long fang-shaped thing coming at you is actually the ceiling that forms a canopy over the platform below. By positioning myself at the end of the canopy and angling my lens upward at its widest setting, I was able to make the tip of the canopy appear much longer and narrower than it actually is. Additionally, the rest of the station is pushed further away from the viewer, making the space look larger than reality. Of course with this amount of intentional distortion, keeping straight lines straight becomes challenging. Through a bit of trial and error and careful positioning, I was able to minimize distortion on the straight lines on the ceiling and platform to my satisfaction. In the end, this was a difficult image to compose and capture, but also an incredibly fun challenge at the same time. I suspect the people who walked passed me in the station that afternoon were wondering what the heck I was trying to do…adjusting and re-adjusting my camera position pointed at the ceiling. Fortunately, this station is near the end of a line, so it is never very busy. As a result, getting the final shot without people was the easiest part. If you are curious what the station really looks like right side up, the picture below shows the station from the stairs leading down to the platform. One of my favorite buildings in Munich is the Pinakothek der Moderne, the Modern Art Museum. I recently spent a couple of afternoons walking around and capturing some photos of the interior architecture. Similar to many modern art museums, the building itself is a work of art. Clean lines, interesting shapes and ever-changing shadows created by the open atrium present a lot of opportunity for photographers. This image was taken on a staircase that winds around the circular atrium walls. While most of the atrium is open to all levels of the museum, this particular staircase is separated by a partial, curved wall. Looking straight up, you see the natural light bounce off of the ceiling creating a great glow effect. As you get closer to the top, the area becomes brighter and brighter. I particularly liked these vertical lines that are spaced evenly as you ascend the stairs. Some of the lines are filled with light, while others are a dark gray. I positioned myself here because the alternating light and dark line reminded me of a center line of a roadway leading into the light. A rather short post today, as life events this week are restricting my free time. I did, however, want to keep my weekly streak alive and publish an image for those of you following this thread. This is a staircase in Hamburg. It is in the Laeiszhof building, one of the many historical buildings in the city. It was the color that first caught my attention. I find something soothing about blue in photographs. This may be the reason I like capturing landscapes and cityscapes in the “blue hour”. I don’t think that I have ever seen a blue staircase before. I suspect others exist, but this was a first for me. Without the blue, I am not sure I would have even taken a photo of this staircase. I have seen many others staircases that are more interesting, but the border of blue made it unique in my eyes. I hope you agree. On this Memorial Day in the U.S., I thought I would share this photo of a war memorial in Berlin. After German reunification, the Neue Wache (New Guardhouse) became the "Central Memorial of the Federal Republic of Germany for the Victims of War and Tyranny." In the center of the memorial is this large sculpture "Mother with her Dead Son" by Käthe Kollwitz. Placed directly under an oculus in the ceiling, the statue is exposed to the rain, snow and cold of the Berlin climate…symbolizing the suffering of civilians during World War II. It had rained earlier in the day and the statue and surrounding tiles were still wet when I arrived at the memorial. The sun was breaking though the clouds and light was finding its way in through the oculus above. This provided a great natural vignette, focusing your attention directly on the statue. While I do not normally photograph this type of subject matter, I was moved by the sculpture and the surroundings…and thought it was a poignant scene that should be saved. While it is wonderful to explore during the day, it takes on almost a fairytale atmosphere at night. The red brick façades, multiple bridges and circular turrets are illuminated by spotlights and create shimmering reflections in the canals. It had just started raining when I arrived at this bridge over the Wandrahmsfleet canal. As you can imagine, it is a popular spot for photographers, but I was the only one there on this night. The scene and the colors were just fantastic. The golden lights were lit on most of the turrets and reflections were everywhere in the water. The light even reflected off of the low clouds overhead, casting a purple hue and making it a little more of a dreamy scene…well worth getting a little wet while taking this image. One of the things I have noticed in Germany is the importance given to staircases in their architecture. Some staircases are proudly displayed in a grand atrium, while others, like this one here, are tucked away in the back of the building and only seen by those who work there. Regardless of their placement, the attention to detail given to the design of these staircases is impressive. I often find the staircases to be the most interesting architectural aspect and I regularly now search them out when visiting a building for the first time. I have photographed many of them and while sometimes they can look similar, they are all unique in some fashion…much like snowflakes, I suppose. I found this staircase while going to an appointment in an office building in Munich. I was running late, so I went first to the elevator. It was being serviced so I had to take the stairs…a fortunate detour. While exploring around the port of Hamburg, I walked past this modern building with an open atrium and a floor to ceiling glass wall. Being a fan of architecture, I walked in just to take a look around and immediately gravitated to the symmetry of the grid pattern on the wall and how it framed the port scene outside. It is rare to have such straight lines in a landscape image and capturing them without any distortion took some time to compose. It was a unique scene…the cranes in the middle were perfectly framed by the door, the clouds were dramatic & moving quickly across the sky and the grid pattern, well, was just cool! That said, it was still a bit sterile…it needed a subject…and then a man walked by, and that made all the difference. A couple of years ago I visited Berlin and was impressed by the amount of interesting architecture throughout the city. The modern buildings built since the fall of the Berlin wall combined with the historical gates & cathedrals provide ample opportunities for architectural photography. 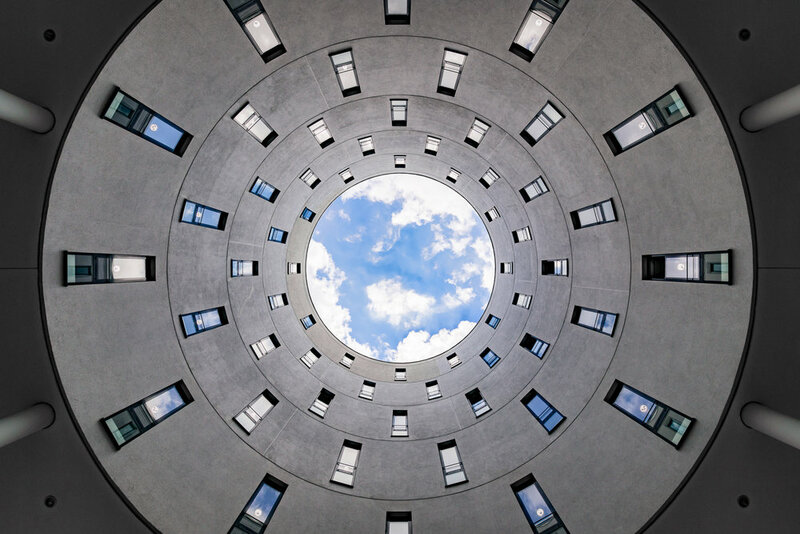 This image features the ceiling structure of the Sony Center in Potsdamer Platz. Its constructed of glass, steel & textile sails and has become an internationally famous landmark of Berlin. The history of Potsdamer Platz is way too long to go into here, but perhaps most notable in its history is the fact that it was split in two by the Berlin Wall and was basically a “no man’s land” while Germany was divided. After the initial opening of the Berlin Wall in November 1989, it was one of the earliest border crossings between East and West Berlin. Since the reunification, the area has been the site of a massive renovation with numerous modern buildings like the Sony Center being constructed to revitalize the area. There is a lot more history surrounding Potsdamer Platz going back to the early days of Berlin, so, if you are curious, I suggest you check out this great Wikipedia article to learn more. It has a lot of good information. Composing an image here was more challenging than I anticipated. It is not as big as it appears in this photo and what you don’t see here are all of the tables, chairs & kiosks of the restaurants and vendors that reside here…along with the crowds of people filtering in and out of the building. Thanks to a wide angle lens and a fairly quiet corner spot, I was able to get a composition that highlighted only the textures and shapes of the roof without all of the activity taking place around me. After a few outdoor images the past several weeks, I wanted to get back inside to another one of my favorite U-Bahn stations in Hamburg, Germany. It is Überseequartier, located in the HafenCity district. It is relatively new, being completed in 2012, and sits near the end of the U4 line...so there are (currently) relatively few people here at any one time. In fact, I was the only one here for about a 5 minute span. The walls and ceiling are covered in blue tiles that reflect the white lights placed in the walls. It is a very modern design with various lines, shapes and angles that I love in architectural photography. And, yes, it is that clean! If you make it here, I suggest you also visit the HafenCity Universität station one further stop down the line. It was featured in a post last month. In case you missed it, you can see that image here. Since arriving in Germany, I have acquired an affinity for photographing the modern U-Bahn Stations here. I admire the way the Germans have designed their newest stations to be works of art, while also being the most efficient way to travel around their cities. Hafen City station is a perfect example of this and a very unique underground station in Hamburg. The train station is constantly changing its colors, lights alternating between red, blue, orange and green. On weekends people line up just to see the light show here accompanied by the classical music of Bach, Verdi & Brahms. I witnessed the light show and it is impressive…especially considering it is a subway station! This is Candidplatz and is easily one of my favorite U-Bahn stations in Munich. It is brightly painted throughout the platform, providing a rainbow effect that changes as you walk from one end of the station to the other. The colors change from purple to blue, green, red & yellow as you walk though the station. The station is slightly curved, so getting a symmetrical shot is a challenge, but I never tire of walking through this place and have included a different perspective below, so you can see the entire color spectrum of this amazing station. This staircase is actually a piece of art designed by Olafur Eliasson. It is a double spiral of steel standing over 9 meters high at the entrance of the KPMG office building in Munich, Germany. The blend of art & architecture, completed in 2004, is called Umschreibung. It is believed to be the only staircase in the world that a person can go up and down without changing direction. Munich has several modern, architecturally interesting U-Bahn stations. This is Westfriedhof station and is one of my favorites. The platform is bathed in light from huge modern dome lights in primary colors. Above the dome lights, neon blue light bounces off the ceiling and reflects off the rough concrete walls creating a great effect as you wonder about the station.